Yesterday marked the end of Ask a Beta Tester, and today we begin the rise from the ashes. Like we've been saying the last few days, we're going to continue Ask a Beta Tester under a different name. What name? We don't know yet. Ask a Wrath Player is what I used today, but is that what it will be tomorrow? Who knows! It's a mystery! Ask a Wrath Player: From the ashes originally appeared on WoW Insider on Fri, 14 Nov 2008 13:00:00 EST. Please see our terms for use of feeds. As a good friend of mine says, "Oh my god, the cute! It burns!" That might not be the most professional opening to my blurb on today's WoW Moviewatch, but it certainly was what I was thinking the entire time I was watching The Lonely Monster by Ollgabopi. The animation is smooth and simple; there's no doubt about what each character is feeling. The music is absolutely appropriate, though I don't know if the creator meant for it to be quite that melancholy. The story and presentation is a little bit of a trope, but the overall effect is that much stronger since it draws on what we already know and feel about this situation. A lonely, friendly monster just wants to be accepted. It's not rocket science, and Ollgabopi lets the music and animation support the emotions of the sequence. I was a little bit disappointed not to have more catharsis at the end, but I think as a piece of stand-alone art "The Lonely Monster" is very strong. WoW Moviewatch: The Lonely Monster originally appeared on WoW Insider on Fri, 14 Nov 2008 12:00:00 EST. Please see our terms for use of feeds. Unfortunately we ran out of time in our Care and Feeding of Warriors series on gear for Wrath of the Lich King ;ast week, just as we were about to cover the weapons to be looking to acquire. This week, post launch, here's a concise list of blues to be had in the 70 to 80 Northrend instances. We've already covered rep rewards, but we may go over some of the same ground here for convenience. We'll be covering tanking and DPS weapons of both the one and two handed variety. Not all warriors will be taking Titan's Grip, after all. Oh, stop looking at me like that, you know it's true. I stated a fact, I didn't kick a puppy, you can turn off the big sad eyes now. Yes, of course I specced fury for leveling. Oh, I'll go back to prot once we're all 80 and raiding again, but there was no way I wasn't going fury. I've written ballads about this talent, you think I'm passing up the chance to use it? Oh my word no. What follows is all pre-raid gear. 5 mans, quests, heroics and badges, but no raids. It's light on PvP gear, because I figure you know how to get that stuff. (Hint: you PvP for it.) Sometimes I mention it if it feels like a category of weapon will be very empty without it, though. Axes, I'm looking right at you here. The Care and Feeding of Warriors: Weapons between 70 and 80 originally appeared on WoW Insider on Fri, 14 Nov 2008 11:01:00 EST. Please see our terms for use of feeds. Many realms have an unofficial truce to allow the other side to fish in their cities, but Himarl of <Serenity Moon> on Lothar isn't taking any chances. Using a leftover Halloween mask, he's fashioned a cunning disguise that allows him to slip into Stormwind for some covert fishing action. However, he's slightly concerned that his tusks may give him away. Meh -- if anyone brings it up, he can just say that his mom was a troll. Dudes dig that. Around Azeroth: Incognito originally appeared on WoW Insider on Fri, 14 Nov 2008 10:00:00 EST. Please see our terms for use of feeds. I think it's safe to say a good chunk of us have been able to play Wrath at least a little bit by now. What do you think? How's your leveling going? I managed to hit level 72 yesterday before I retired for the night, and while I'm not leveling as quickly as I'd like, I've deemed my progress acceptable. I did some pretty serious beta testing during the Wrath beta, so I've quested through every single Northrend zone already. While I love the content and don't really mind doing it a second time, I'll admit that Nymh's accomplishment makes me a little jealous. At least that way if I could finish up with my main in a day or two, I could go right into my alts (who I didn't get to play much in the beta) until my friends caught up. It'd make things feel a little more new to me than they are. That's not really something I'm able to do though, so level 72 it is. I'm going to aim for a level a day, and if I manage something at least close to that I'll be happy. Do we have anyone nearing 80, or in the high-70s reading WoW Insider this morning? My server has a few already, so it wouldn't surprise me much at all! What level are you? originally appeared on WoW Insider on Fri, 14 Nov 2008 09:00:00 EST. Please see our terms for use of feeds. After the Midnight Launch, I rushed home with my precious Collector's Edition, installed, patched and made a Death Knight. I'm not ready to play my DK yet, but I wanted to reserve the name and get her resting. Then I put my druid on a zeppelin and went to Northrend. I didn't research the best starting zone for my class. I didn't even think about where the zeppelin might be taking me. I just randomly chose the Undercity portal from Shattrath and went from there. So here I am in the Howling Fjord. From a Tauren perspective, I'm not sure how I feel about doing chores for the Forsaken. Ah well, we're all in this together, right? Where did you begin your Northrend questing? Did you research your decision, choose randomly or follow the pack? Breakfast Topic: What Northrend zone did you begin in and why? originally appeared on WoW Insider on Fri, 14 Nov 2008 08:00:00 EST. Please see our terms for use of feeds. Welcome to Scattered Shots, the weekly Hunter column which is written by a guy who doesn't generally spec for said talent. So. I'm here. I'm not completely wrapped up in Wrath, I promise. In fact, just to show how much I am not wrapped up in the here and now, in the long lines for the queues and prospect of getting a beautiful worm pet and all that good stuff, I'm going to predict the future! Let's look at some of the promises and perils that 3.1 and other future patches will bring for the Hunter. Scattered Shots: The Future Soon: Hunters in patch 3.1 and beyond originally appeared on WoW Insider on Thu, 13 Nov 2008 23:30:00 EST. Please see our terms for use of feeds. Reports of the first character to reach level 80 are flooding in, and there are screenshots to back it up. 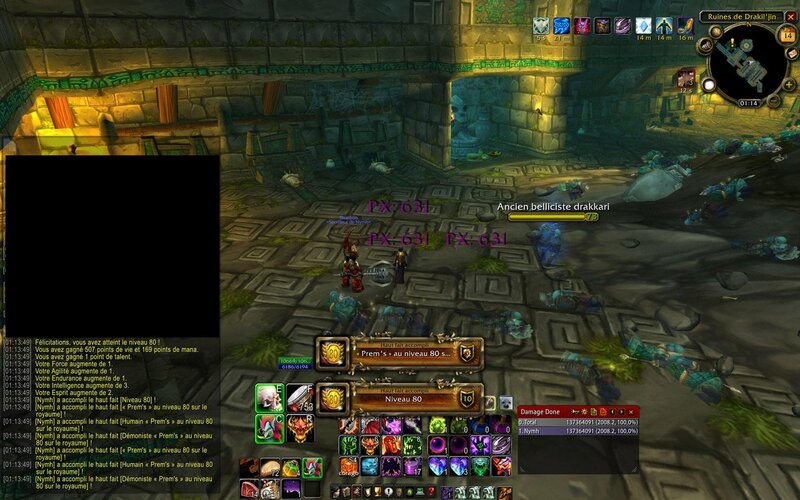 Congratulations to Nymh of EU Drek'thar on your achievement! Nymh's Armory displays her (him?) as an SL/SL Warlock, which I've been told is an exceptionally good grinding spec, especially when coupled with a healer. Judging by her buffs in the full screenshot, it looks like she just may have had a pocket healer on the journey to 80. A Discipline Priest, specifically. Whether the Priest was there the whole way through or just happened to be partied with Nymh at that moment, we're not really sure. That screenshot also seems to be from the Grizzly Hills, which is roughly a mid-70s zone. Nymh may have dinged 80, but she still has plenty of content ahead. I hope the trek to 80 was an enjoyable one! How long until you start leveling your alts, Nymh? Nymh of EU Drek'thar first to level 80 originally appeared on WoW Insider on Thu, 13 Nov 2008 21:20:00 EST. Please see our terms for use of feeds. Queues are the highest most of us have ever seen tonight. On my home server of Eldre'Thalas I was behind over 850 people at one point, and have had over an hour wait be estimated for me more often than not. I maxed out at 115 minutes. The estimated wait time will fluctuate back and forth depending on the frequency in which players log off or leave the queue in frustration. Perhaps the biggest thing we need to worry about this expansion is not server down time, but the phenomenal amount of players wanting to get in the game. If Blizzard has any announcement about this, or solutions (other than transferring realms) we'll keep you updated here. Other than that... good luck getting in. The World (of Warcraft) is full, please come back later originally appeared on WoW Insider on Thu, 13 Nov 2008 21:15:00 EST. Please see our terms for use of feeds. I like to think this is in response to Jose here: Nethaera has announced some free realm transfers for North American players, to complement the European ones. In addition, the list of eligible realms for migration to Fizzcrank, the new transfer realm, has been expanded. The transfers to Fizzcrank are currently active, and are scheduled to run until Monday, 11/24, 12:00 PM PST. Realms newly eligible are in italics. These moves, on PvP servers, are just your run-of-the-mill free server transfers. They are currently active, and are scheduled to run until Thursday, 11/20, 4:00 PM PST. So who's switching homes? Those are some extremely popular realms in the source sections there; denizens of Dentarg and Haomarush, are you up for the influx? US transfers now available originally appeared on WoW Insider on Thu, 13 Nov 2008 21:00:00 EST. Please see our terms for use of feeds. They will be open from today, the 13th, until Wednesday, November 18th. This is really not your typical character transfer here. Usually there's a group of source realms with one destination realms, sometimes two. I'm not sure I've ever seen something like this: 14 source realms with 14 different destination realms. This may have to do with the more fractured situation in Europe - with four realm types (PvE, PvP, RP, RP-PvP), five languages, and I'm not sure how many time zones, I can see how it might take some juggling to keep moves within one category. As always, if you do want to switch, you're advised to do it early, because transfers can be closed if the realms meet their desired populations early. Edit: I see that all of these realms are English and CEST (thanks, Sethox). No clue why they're so fragmented, then. Many free transfers for Europe originally appeared on WoW Insider on Thu, 13 Nov 2008 20:00:00 EST. Please see our terms for use of feeds. Northrend is finally available, and it seems like everyone is out in full force. There are so many new things to do and see that it might be pleasantly overwhelming at the moment. In order to help you find some direction, I've put together a list of 10 easily attainable achievements that you can earn in the next few days while questing. These are along the way, so you won't have to break your stride. Many can even be achieved today. 1. Train one of your professions! A skill of 350 in any of your professions will open up the ability to train Grand Master, which will award you with the achievement, Professional Grand Master. Check out our guide to finding your profession trainers. 2. Most level 70s will have at least two professions with a minimum skill of 350 by this point, so why not train them both to Grand Master? This will give you the achievement, Working Day and Night. 3. If you have leveled Fishing, First Aid and Cooking to at least 350, and train their Grand Master ranks, you will earn the achievement, Skills to Pay the Bills. If you haven't, but would like to, then check out our guide to leveling Fishing to 375 as well as Cooking to 375. First Aid should be a breeze, as all you need is cloth! Still, should you find yourself at a loss, check out our Guide to Farming Cloth. 10 easy Northrend achievements originally appeared on WoW Insider on Thu, 13 Nov 2008 19:00:00 EST. Please see our terms for use of feeds. The Countdown to Wrath Giveaways continue, and we're putting another Razer product in the mail for one lucky winner. In Greek mythology, Lachesis was the woman who determined just how much time everyone had left to live, and with the Lachesis gaming mouse, you'll be able to do exactly the same -- with a 4000 dpi laser and 32kb onboard memory (that's right, this mouse has its own memory built in), you'll be the one deciding just who lives and dies in the Arenas, raids or BGs. To enter, leave a comment on this post before Sunday, November 16th, 2008 at 6pm ET. One winner will be chosen randomly and will receive a Lachesis gaming mouse (valued at $80). You must be at least 18 to enter and a legal resident of the United States or non-Quebec resident of Canada. You can only enter once. Click here for complete Official Rules. When we told our own Zach Yonzon that we were giving away this mouse, he pretty much fainted from the excitement. But he's not even eligible to win it -- you are, so leave a comment below, and good luck. Countdown to Wrath Giveaway Day 0 - Razer Lachesis mouse originally appeared on WoW Insider on Thu, 13 Nov 2008 18:00:00 EST. Please see our terms for use of feeds.